Month 4! I was just telling Romel the other day that although it’s only been four months, I can’t remember what life was like pre-Nayla. At least for me, I think life really started when this little one entered into our world. This month, Nayla has continued to grow and develop in so many ways. She’s even making headways towards crawling! First (Canadian) Thanksgiving: Nayla celebrated her first Thanksgiving this month. 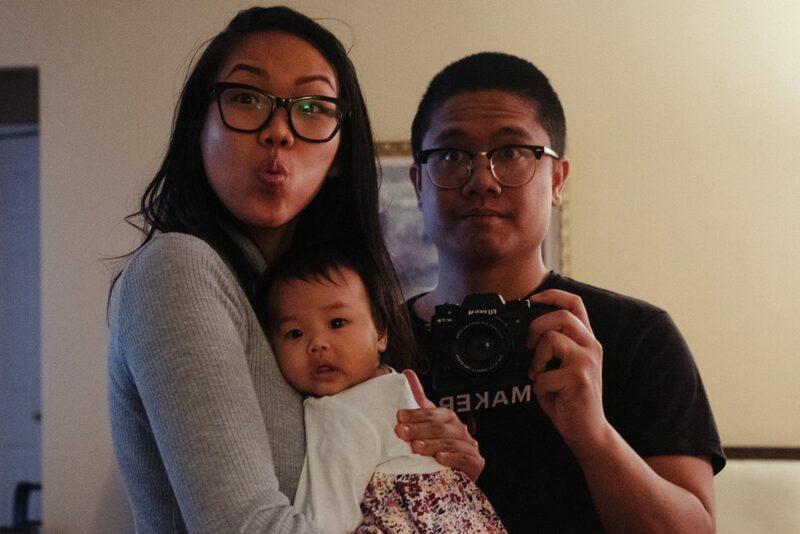 Although Romel + I spent the holiday stuffing our faces with delicious food, Nayla was on the sidelines watching us (I always feel so bad eating in front of her). We had dinner with Romel’s family on Sunday and then a late lunch with mine on Monday. We are always so grateful to be surrounded by family and this year we’ve been especially blessed with this little bundle of joy. Toys Galore: Nayla doesn’t have too many toys… yet. I’m sure they’ll gradually take over our home soon enough. I’ve purchased most of her toys on sale from Amazon and we have a few favourites! Nayla absolutely loves the Rattle + Roll Toy Car by Oball. It’s easy to hold onto with the holes on top and makes just enough noise with the little balls in its wheels! 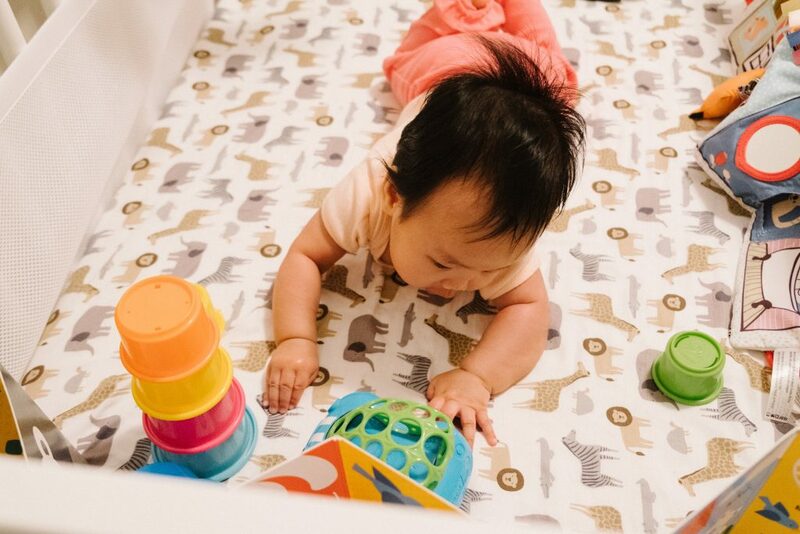 It’s also fun to see her push it back and forth with her hands during tummy time, as well as make attempts at crawling in order to reach for it. 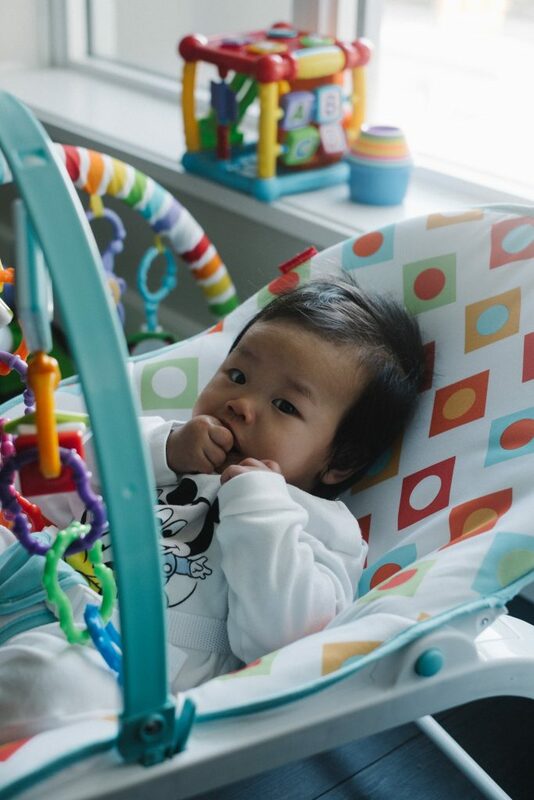 Another favourite is the Winkel by Manhattan Toy, which acts as a teether + a rattle. 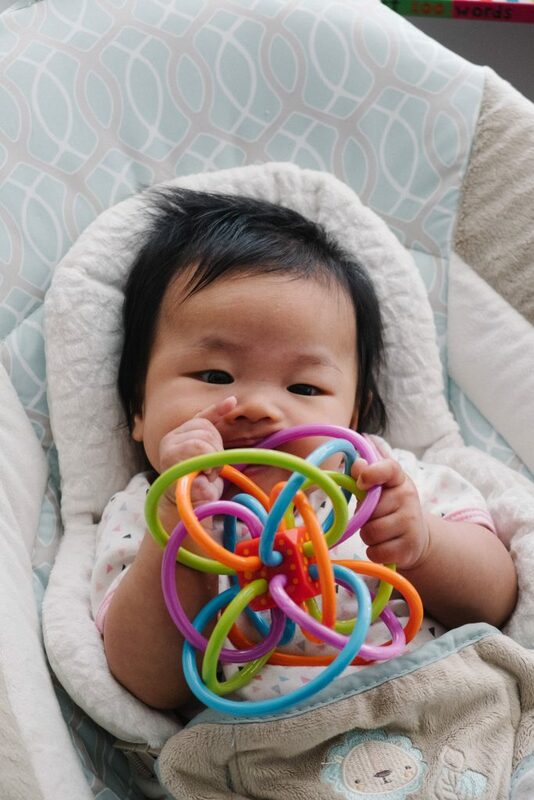 I love it because she can play with it on her own and it keeps her hands + mouth busy! Lastly, I can’t tell you how much I use these Playlinks by Nuby. 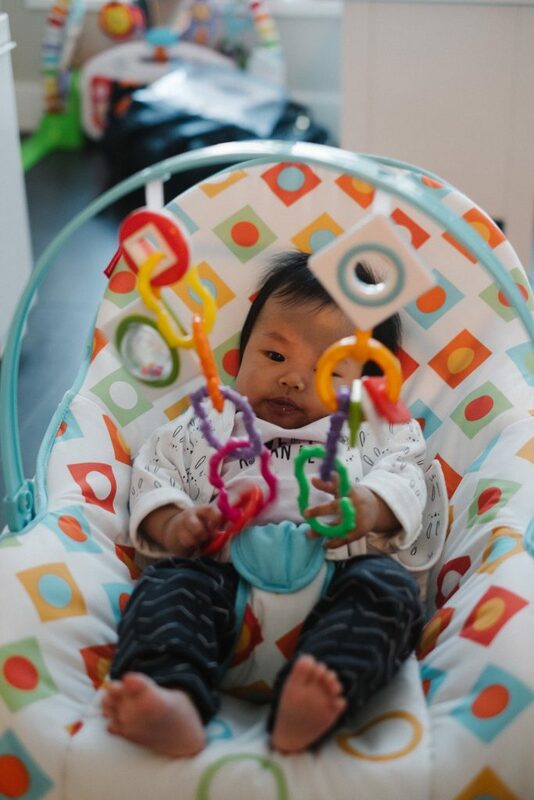 They are great to attach toys to on absolutely everything, from her play gym to her rocking chair. She loves grabbing at them and putting them into her mouth (yes, they’re also teethers!). 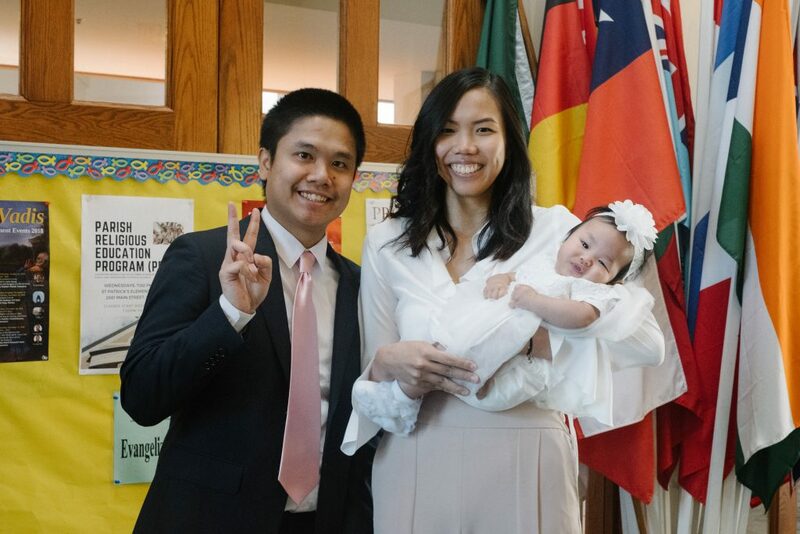 Happy Baptism, Nayla! 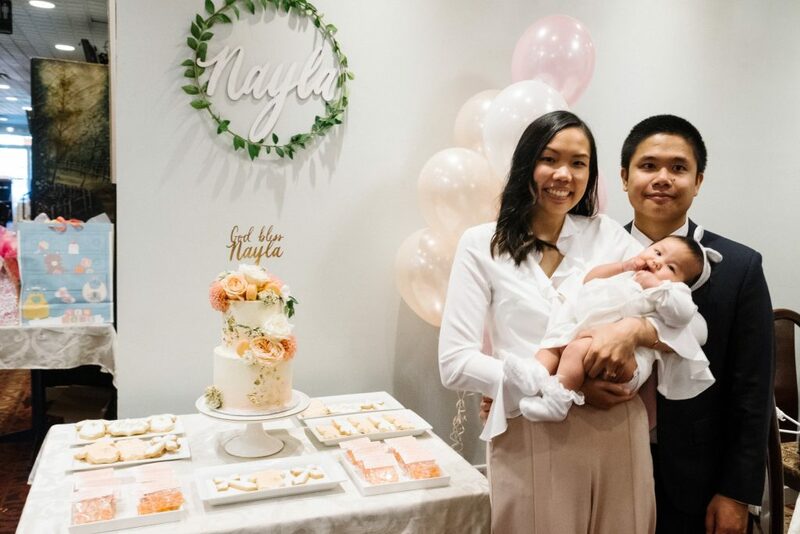 : We also celebrated Nayla’s baptism this month with our family and friends. We had a small ceremony at St. Patrick’s Parish where she was welcomed to the Church and her uncle + aunt became her godparents! It was such a joy to see all of our loved ones share in the celebration – we don’t get together often enough! We hosted a reception at a local Chinese restaurant and had some delicious treats afterwards by Noms by Mon. I am absolutely in love with the gorgeous cake she created for our little girl! 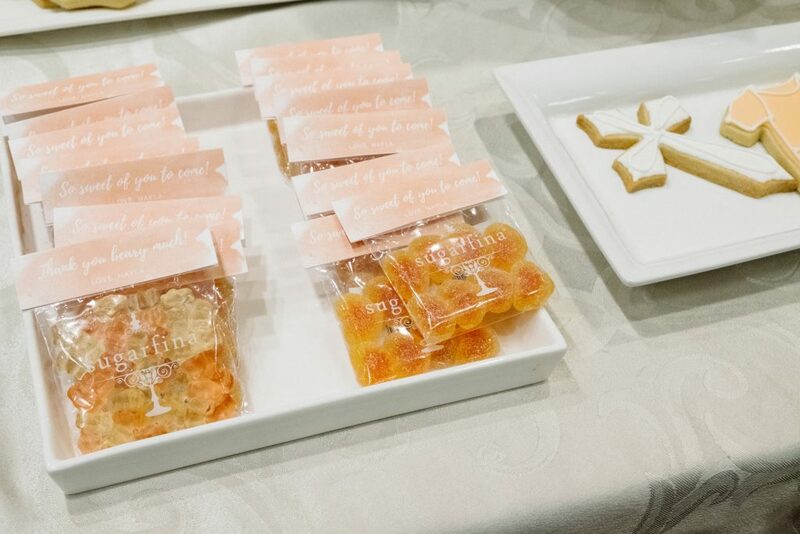 For favours, I made little tags for some Sugarfina champagne baby bears + bellini fuzzy peach gummies. On an aside, I have to give some mad props to my family + my girlfriends for all the events they’ve previously planned for me (bridal shower, baby shower, etc.) 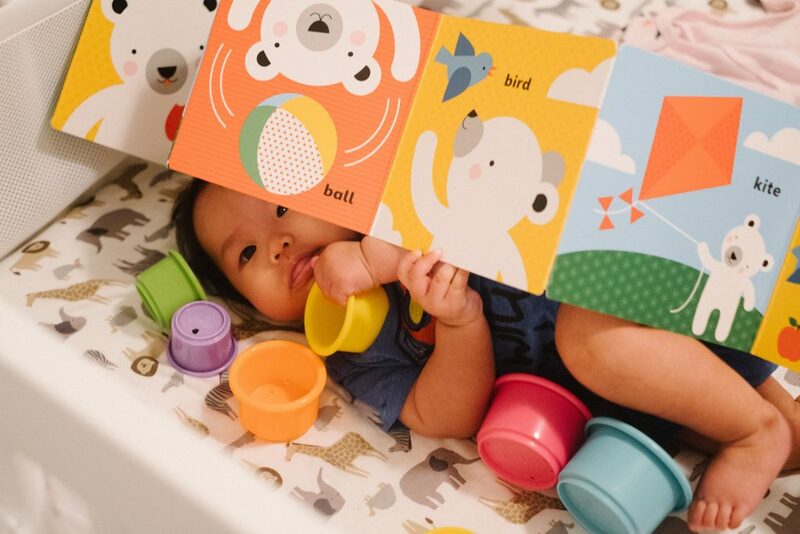 because planning is haaaard work – especially with baby brain. I think the last event I planned was our wedding, which feels like decades ago! 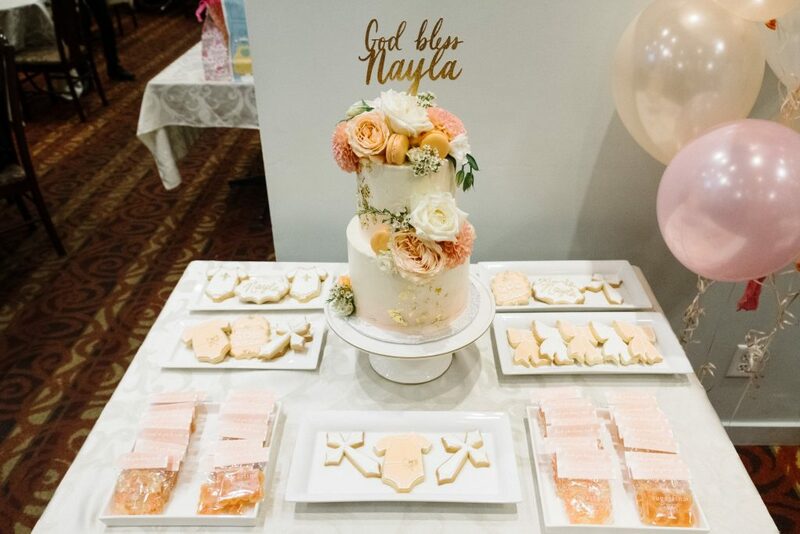 A huge thank you to all of our loved ones for joining us on this special day and for showering Nayla with so much love + gifts! 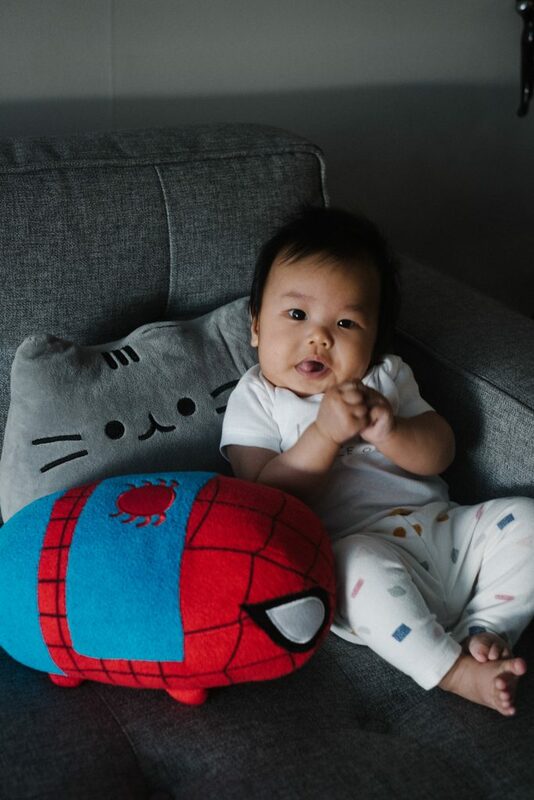 The Amazing Spider-Nayla: Everybody seems to know that Romel loves Spider-Man… so much so that a lot of the gifts that Nayla receives are Spider-Man related! Don’t get me wrong, it is pretty cute but it’s getting a little excessive (haha!). 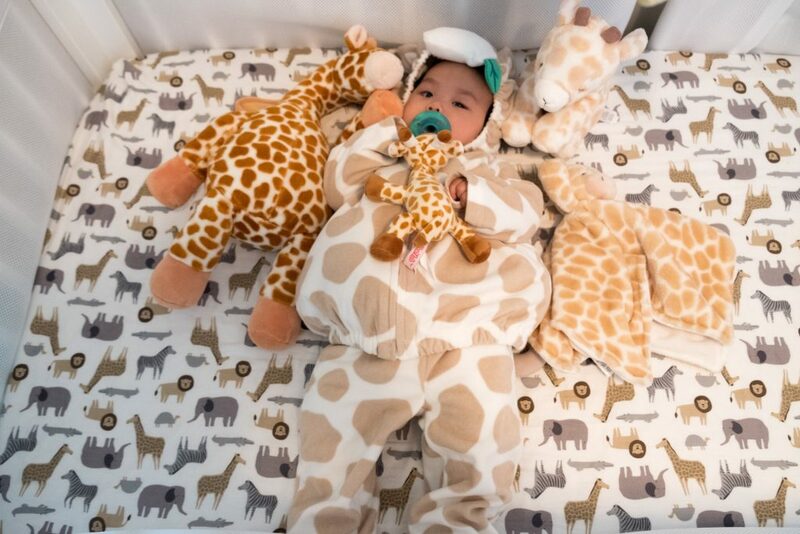 With Halloween just around the corner, Nayla has two outfits to choose from for her first year dressing up – a giraffe costume (from her Grandma) and a Spider-Man onesie (from our relatives in SF). Hmm… Spider-Giraffe? 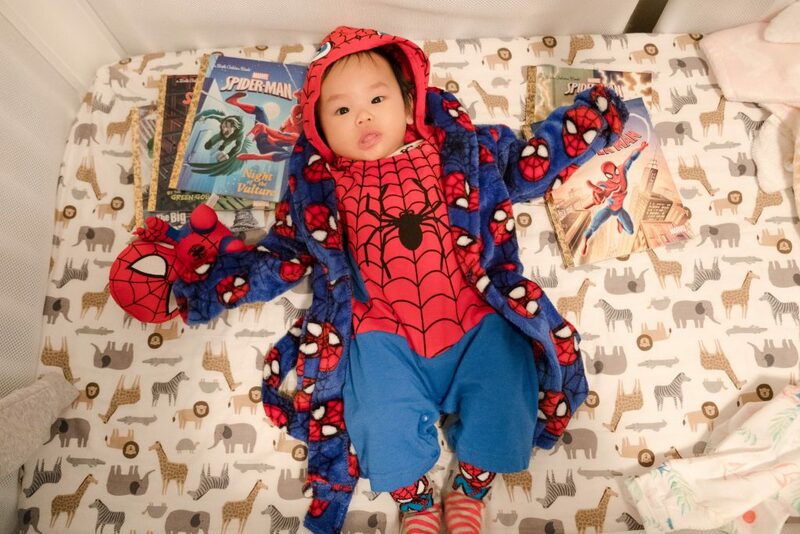 Romel really wants to get in a few rounds of trick-or-treating and milk the benefits of having a kid. I suppose he’s right, free candy – why not?! Nayla can’t eat it with that one poking tooth anyway. This month has been pretty hard on all of us, especially sleep-wise. It’s become quite the challenge putting Nayla down at bedtime and putting her back to sleep in the middle of the night. We’ve had to make some adjustments over the past few weeks and often, we’ve had to stop and remind ourselves that this is only temporary. We receive a ton of advice from family and friends, as well as read a lot of different suggestions on forums – but we’re still trying to figure out what will work best for us. 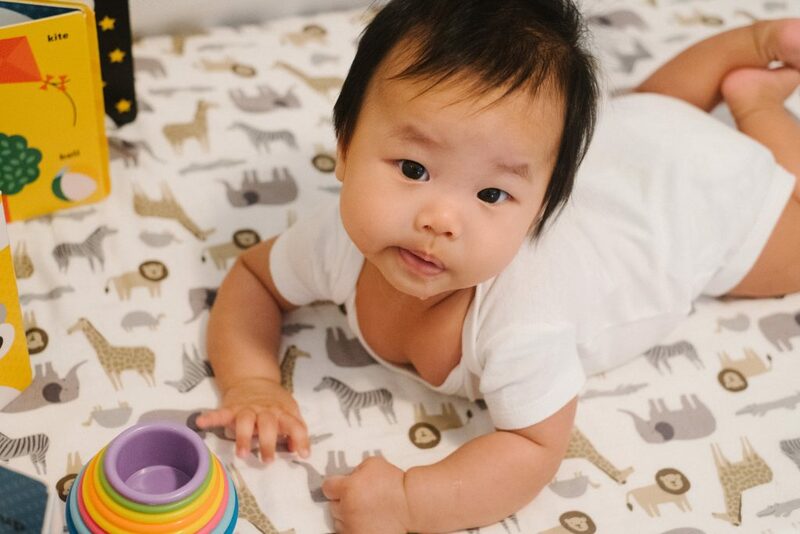 We’re always open to any suggestions regarding babies + sleep!